so gorgeous! loving the laidback vibe! Cannot beat stripes! Such a cute little outfit, I love it! Love the whole outfit but I am so jealous of you Alexander Wang bag! love how casual this looks, yet so fashionable and lovely. I've been loving stripes! This is amazing, I am in loooove with chic stripes. Love the stripes and with the slip ons! Amazing news being in Company Magazine. Love this dress. You look so cute! 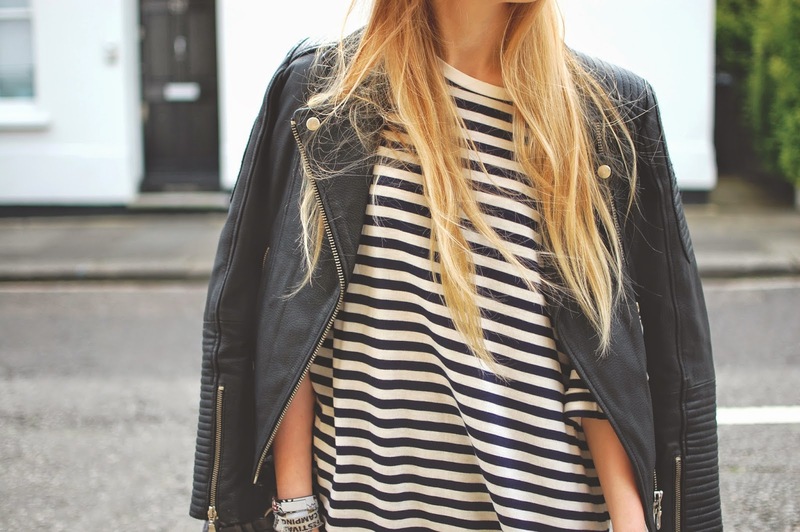 I love this outfit, you can't beat classic stripes and a leather jacket! This is just perfect, love a good stripes and leather jacket combo and amazing duffel bag! love this whole look! looks so comfy and chic! I love your dress! Stripes are always a winner. And wow - it's so cool that you're going to be featured in Company magazine!! Simple but so cool, you can't go wrong with a stripe!